Method of fermentation: cool temperature fermentation in stainless steel after destemming and 17 hours soaking on the skins. This rosato is also certified organic 100% Montepulciano from a four hectare parcel of cordone speronato vines, planted at a density of 5,000 plants per hectare. The vineyard is 260 meters above sea level. Centorame harvests very late in the season by regional standards. Hand-harvested, 100% destemmed, the contact to skin is limited to under a day and fermented in stainless-steel tanks and released the spring after harvest. Certified organic. 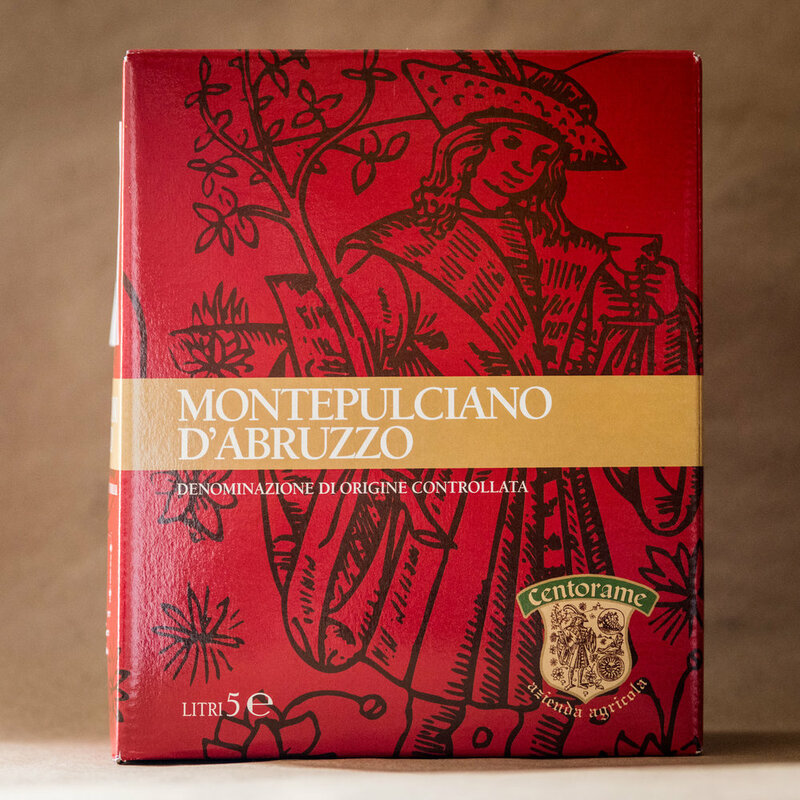 100% Montepulciano, from a four hectare parcel of cordone speronato vines, planted at a density of 5,000 plants per hectare. Clay-limestone soils. The vineyard is 260 meters above sea level. Centorame harvests very late in the season by regional standards. Hand-harvested, 100% destemmed and fermented in stainless-steel tanks with 20 days of skin contact. 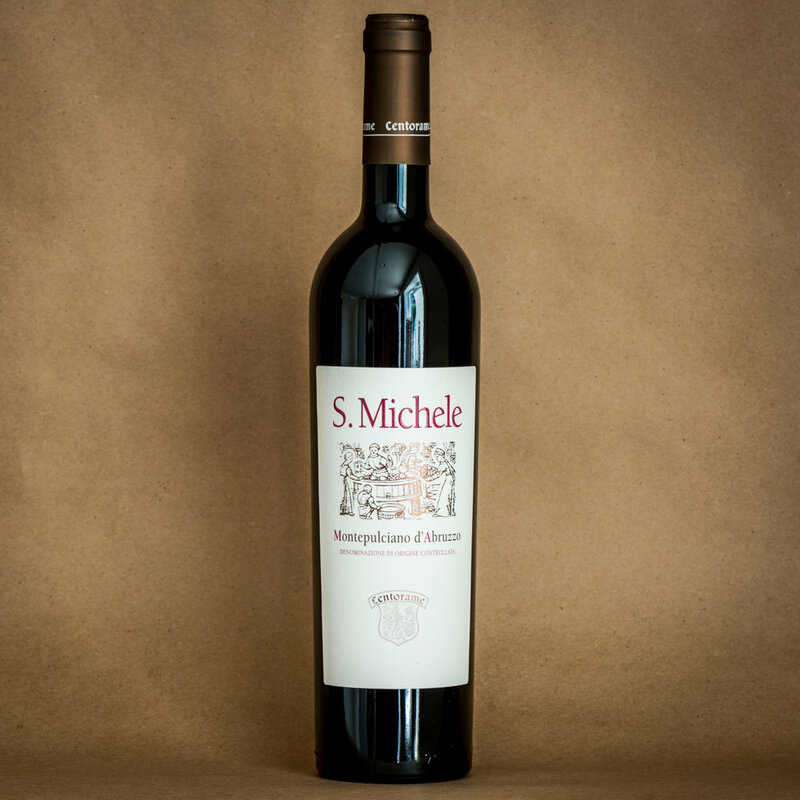 San Michele is aged for one year in steel tank and one year in bottle before release. From high, hilly central Abruzzo, near Atri. Lamberto Vannuci started this certified-organic solar powered farm. He makes small amounts of remarkably smooth, ripe Montepulciano. Braised meats with red peppers, lamb, game, winter stews, burgers… pairing options are numerous. To arrive at Centorame from the coast you wind up and up and up. You’ll probably get lost. This journey is the best way to understand how wines made in the Colline Teramane part of Abruzzo are fundamentally dissimilar to greater quantities of Montepulciano d’Abruzzo and Trebbiano d’Abruzzo made to the south on flatter fields. I like tasting wine at Centorame. Lamberto Vannuci’s father is always present, quiet but affable, the tasting room looks out over Centorame’s vineyards and also has a window into the winery. It’s a simple, calm place, really nice for thinking about wine. And Lamberto strikes me as a kind, very decent person. We aren’t friends, and our time together has mostly been limited to discussions in vineyard and cellar. But first impressions are what they are. I’m convinced the motivations here are to make great wine evocative of Casole. Lamberto’s farm has an awesome location, and I think he is the right individual to get the most from it. He started Centorame in 2002 with 3 hectares. Lamberto’s father had been active on the farm beginning in 1987, on land purchased by his father 20 years earlier. But Lamberto started wine bottling activity, and each year he plants a little more: now there are 10 cultivated hectares. Also there are old olive groves and a one-hectare cherry orchard. All in all, I like the look of the place. Nice hillside plantings, plenty of evidence of natural farming methods, attention to detail, craft. Centorame borders an important nature reserve, protected “badlands” formed by water eroding down the area’s steep hills. Large stands of solar panels loom over one of Lamberto’s fields. They look like full-scale props left behind from an Empire Strikes Back outdoor battle scene. They are impressive. Centorame is a busy farm. Look closely at the place and evidence of the bustle of activity are everywhere. Details have been attended to. There is evidence of recent plowing between the rows of Montepulciano, Trebbiano, Pecorino and recently-planted Passerina. No chemical fertilizers are used at Centorame, only cow manure. Most of the vines are trellised to cordone speronato, planted to a density of 5,000 plants per hectare. Close to the winery is one parcel of 30-year-old Trebbiano that is still grown on the old, low-density pergola Abruzzese. This method of growing is solidly out of fashion, but in hot vintages the extra space lessens the impact of radiant heat retained by stony earth on the vines, keeping the wines moderate in alcohol and fresh tasting. I like seeing the pergolas, and in my experience they can produce enjoyable wines. 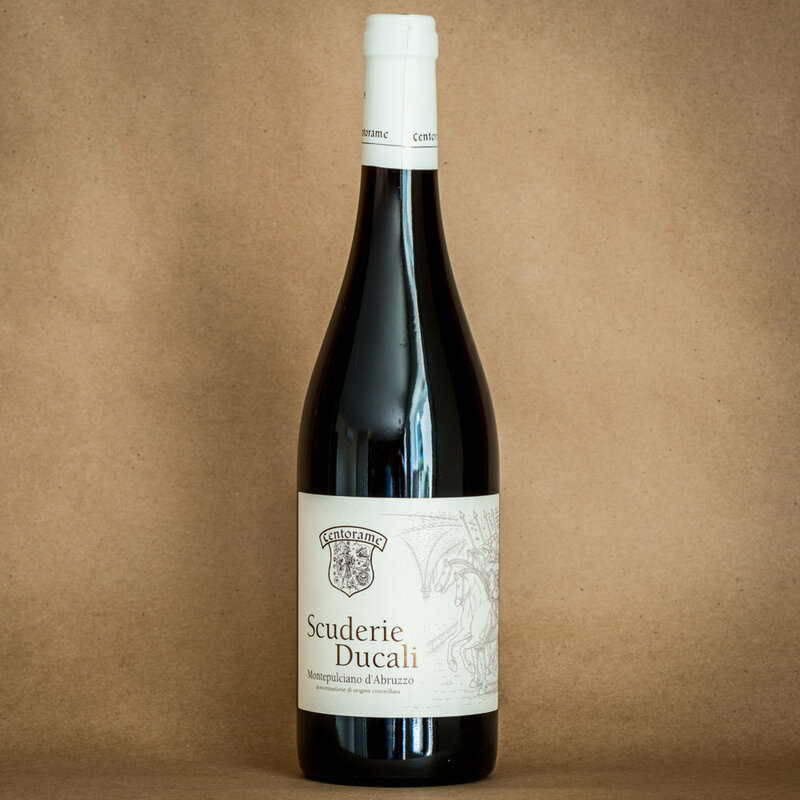 Vanucci believes in “using slow, good machinery that respects the grape.” All of the fruit is estate-grown and hand harvested in small baskets, from parcels quite close to the cellar. In regions that can be warm at harvest (like Abruzzo) this does matter. It is better for the eventual wine if little time passes between fruit being picked and finding shelter in a cool cellar. The cellar is remarkably, shockingly clean. Each parcel of Vanucci’s estate is vinified separately, then selections are made at the end of the process to create a final blend for Centorame Montepulciano d’Abruzzo, Trebbiano d’Abruzzo etc. To the stranger, unstudied in local lore, there isn’t much to see in Casole. Lamberto drives me through town after our (hair-raising at times) tour of his steep, muddy vineyards. Lots of paintings from a prominent local artist have been hung on the streets and alleys, a nice idea and dose of the unusual in this tiny stone town. He is proud of this work, and clearly enjoys the idea of an outdoor gallery. Maybe it suits the mindset of a farmer. I feel like Lamberto Vannuci grabbed the ball and ran with it. He has done everything possible to make the right wine in his homeland, and Centorame silently asks me the question “Are you going to take this project the last five yards?” I’m glad to join this team, to partner in our small way with work of this caliber.